During the holidays, we get special unexpected deliveries at our door and this one was quite sweet: Cinnamon dropped up not only fresh Bon Bites Cinnamon Rolls, but an entire box of sweet goodies to make desserts with (click on the link to see the entire package). Inspired to share, I made this Cinnamon Roll & Dulce de Leche Bread Pudding and gifted it to a friend – you should too! This post is thanks to the goodies sent by Cinnabon to me free of charge, but my thoughts and love for cinnamon rolls are my own. No payment was received for this. When I opened that box and smelled the BonBites™ – I seriously swooned. The smell was intoxicating, in the best way possible and I knew I had to have one. Warmed up, it’s literally like a bite of heaven. Quickly, I also knew I had to bake something with them as to not consume the entire box of BonBites™. 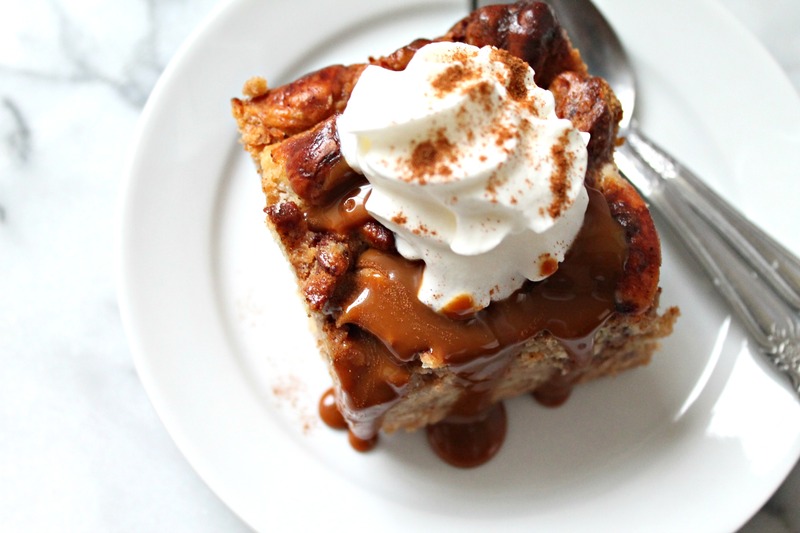 That’s when this Cinnamon Roll & Dulce de Leche Bread Pudding came to mind! Bread pudding is such a classic dessert and one I grew up making, but my mother studded it with prunes and a prune syrup. This time, I wanted to knock it out of the part with a ton of spices like cinnamon and ginger to enhance the cinnamon rolls, did no add extra sugar to the batter since the rolls were slathered in frosting already, and then finished it off with dulce de leche and whipped cream. Served warm, there’s nothing better. Since the gifting holidays have passed, I know a lot of you are returning gifts at the mall. Make sure to stop by a Cinnabon and stock up on some to bring him – not just to eat directly, but to bake up a sweet dessert like this bread pudding or one of the many other ideas on their website. This Cinnamon Roll & Dulce de Leche Bread Pudding is just what you need - sweet, delicious bread pudding love! Whisk together the eggs, milk, spices and baking powder. Soak the chopped Cinnabon rolls for 15 minutes, stirring occasionally. Pour into a greased 8" by 8" pan and bake for about 35-40 minutes until puffed and golden brown. Once out of the oven, drizzle the dulce de leche all over. Serve warm with whipped cream or ice cream, or both!